And if I want to be of true comfort - and along the way, exercise the self-discipline to not dump - then God will provide those resources. One of my favourite hymns. Note especially the third verse, given the current conversation. So I have a little theory. It has to do with encouragement. But what is encouragement? Thoughts may leap immediately to comments about nice dresses and haircuts. And if someone I know is about to step into an important job interview, then a comment about the nice dress and haircut may be just the thing needed to give that extra burst of confidence before facing the panel. And now go back to the word encourage. It means to give someone courage to press on. It's not just about saying nice things. Encouragement can happen in a couple of ways - horizontally and vertically. The horizontal aspect is when we work on our relationships here on the ground, as it were, doing and saying helpful things to give one another the courage to press on. Vertically speaking, a Christian is encouraged when you point them back to Jesus. When you remind them of their relationship with God and remind them of all the promises of God for them. That is truly strengthening. 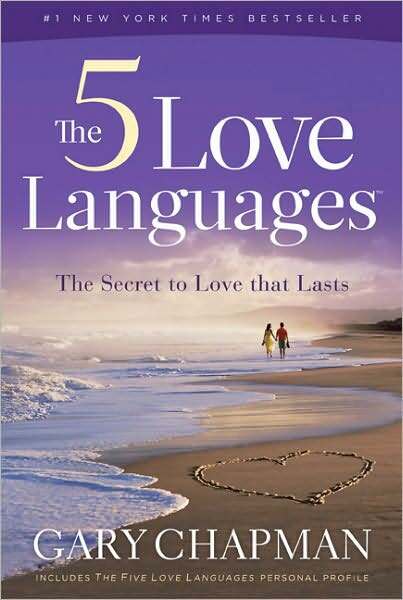 My theory (Part B) is that is that the five love languages can also help with encouragement. How can I encourage someone in a way that truly gets home? Easy. Encourage in their language. How do you encourage me to press on in my role as a Sunday School teacher? Well, I am not a gifts person. At all. So, while I like flowers and am happy to buy a bunch of daisies for myself when I think I need some on the kitchen table, if you give me a bunch of flowers to encourage me in my endeavours it won't really get right down deep. But if you come to church a bit earlier than usual and drag those trestle tables from one side of the hall all the way over to the other side and set them up for me...wow! I could last a week on that. You see, I am an acts of service girl. Now, there is more to it than the five love languages. For example, if I want to encourage a fellow blogger (and there is a more than fair chance that I don't know their dominant love language) I will leave a comment on their post. Or if greater encouragement is needed and I know their address, I will write a letter or at least send an email. Bloggers are word people - and they are encouraged by words. Like gifts, words of affirmation is not my love language. But it is no secret to those who read this blog that I love letters. So a letter will hit the spot. The art of real encouragement that will truly reach its source is to know the one you seek to encourage and then to encourage them in a way that they will hear it. The five love languages provides at least a solid start to getting it right. Remember Comfort in, Dump out? I gave all sorts of dumping examples but was pretty quiet on the comfort bit. But I think encouragement - seeking to give someone the courage to press on - is the umbrella for all sorts of things like helping someone to press on with a task, helping to push someone across some sort of finishing line, commending someone for a job well done (which may just encourage them to keep serving in that and new ways), paying someone that compliment or saying, "Well done," and it's also providing comfort to someone in the centre of the illness, bereavement or distress ring. But encouragement is such an upbeat term. Comfort then is its quieter, gentler cousin. If I encourage someone in the midst of despair or serious illness it doesn't mean joyously getting them on their feet and marching them victoriously out into life again. Comfort is the encouragement (vertical or horizontal) that gives the person in crisis the courage to press on, maybe just for the day. Or for the hour. Or even just for the next minute. And the best comfort is targeted comfort. Know who you are comforting. If I feel uncomfortable about receiving gifts when I am well, then I will still feel uncomfortable about it when I am sick or bereft. If I don't like slapstick humour when I am well, then sending me a funny card to cheer me up when I am in the middle of my distress is not going to work. Meals are often great. But then I have a friend who loves cooking so much that when she is stressed, distressed and even sick, she cooks. She cooks because it refreshes, sooths and calms her. (I can hardly imagine it...) Preparing a meal for her probably won't speak words of comfort into her sadness. But quality time will, because she is a quality time girl. Going and sitting in her kitchen with her and chatting while she cooks, all afternoon, will do it. How to provide comfort in? Know who you are comforting and then speak their language. In that way you will love them well and help them to press on in good courage. A display connected to the theme for the week. Every year during the first week of the July school holidays our church runs a Holiday Bible Club for primary school aged children. This has been happening here for a long time - 24 or 25 years I've heard it said - so it's a well oiled machine. A couple of dear ones have asked me to blog about it so here goes. 9:00 - 9:15 Registration and drop off. While that is happening the children are ushered into the hall (via the church so that they can see what a church looks like) to colour in a picture connected with the day's story. The pictures are glued onto a mural that builds up over the week along a big section of the hall wall. 9:15 - 9:45 The children go outside for fast, furious, non-stop action games. That is, the children are run ragged for half an hour to burn off energy so that they're ready to sit still and listen. 9:45 - 10:45 Teaching time. We have someone from OAC Ministries come each year to run this hour of Bible teaching through stories, games, quizzes, puppets and all sorts of fun. The folk at OAC are really, REALLY good at what they do. Outsourcing the teaching to experts in the field frees us up to make sure the rest of the programme is as good as we can make it. 10:45 - 11:00 Morning tea. Our trusty team in the church kitchen put on a morning tea fit for a birthday party five mornings in a row. 11:00 - 11:50 The children do a craft activity connected with the theme of the teaching time. We try to have someone ready to play games with those who finish early so that everyone is kept busy and occupied right up until the last moment. 11:50-12:00 Final notices, a prayer and off the children go home with their parents. On the Friday we reverse the order and invite the parents to join with their children from 10:30am. 9:00 - 9:15 Registration and colouring in. 10:30 - 11:00 Parents, children and leaders have morning tea together. 11:00 - 11:50 Teaching time - which includes a bit of summary of the week, new material and a presentation of the Gospel for the children and their parents, all at the skillful hands of the OAC presenters. 11:50 - 12:00 Wrap up, prayers and farewells. Each year we run to the theme provided to us by our speakers. This year it was Heroes from the Bible. Other recent themes have included The Beatitudes, The Fruit of the Spirit, Stories Jesus Told and a theme that tied in with the Olympics. There is memory verse for each day. There is debate about this. 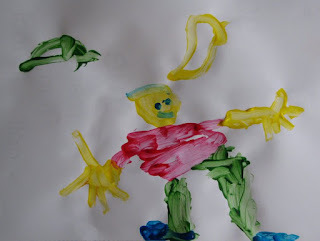 But we charge $5 per day per child with all sorts of exceptions for differing circumstances. The money collected goes towards paying for OAC to come and for some reimbursement for craft and food costs where required. We didn't do it this year, but some years we have a dress-up day, usually on the Thursday. Last year when we did the Beatitudes everyone got to come in yellow and black (bee colours) and we even had a few dressed up as bees. We send a letter of invitation during term two to children who have attended HBC in the last three years. Each day of HBC the children take home a letter which includes a summary of the day's story and teaching, the memory verse for the day, advanced notice for the Friday morning tea arrangements, notices about the bookstall running and any other thing we might need to advise and contact details for the church. And every child who attends receives a letter by mail during the first week back at school thanking them for their attendance, reminding them of the things we learned, wishing them well for the term ahead and with some information about our normal Sunday services. Other advertising is via flyers to all the students who do Scripture in the local primary school, posters in the local shops and library and letters are sent to local churches and nearby schools for their newsletters. That's it in a nutshell. Seems so straight forward when you put it like that. :-) Let me know if you want more info, and if anyone else has these sort of programmes running at their church, please let me know what themes you have used. I'd be interested to collect ideas for future reference. After an afternoon spent with a friend talking deep and good things over a pot of tea why, to finish off our time together, didn't I pray? When I sat and listened to someone talking about how truly hard life is at the moment, instead of saying, "I will pray for you," why, then and there, didn't I pray? During recent weeks, when I found myself fretting over something again and again why, instead, didn't I pray? While on the phone and hearing the details of a friend's crisis or as I sat and read the email with the bad news why, on the spot, didn't I pray? When I was wronged or just plain irritated why, instead of harbouring bitter thoughts, didn't I pray? When I was standing in the queue for all that time why, instead of staring into space blankly, didn't I pray? There's lots of good advice out there. When you do, rinse the leftover weetbix off the bowl before it sets like cement. It's always important to use your manners. Plan for it to work. If you have been off work sick, come the afternoon of the day you think, "I am well enough to go back to work tomorrow", go to the supermarket and buy eight things from eight different aisles. When you get home, if you have enough energy to put all eight items away as soon as get back, then you are well enough to go back to work. If you need to sit/rest/have a nap first to recover from the shopping trip then you need another day off. But what is the best advice I have ever received? The best specific advice I have ever received was from a dear, trusted friend, just before our first son was born. She said, "Five minutes is better than no minutes." She was referring to Bible reading. What? Only five minutes? But what great advice it turned out to be. Because having a baby rocked my Bible reading world. It isn't that mums of new babies don't have time to read. New mums don't lack time, but what they do lack is a) the capacity to maintain that very wonderful routine of rising early and enjoying a long, uninterrupted quiet time and b) the capacity to concentrate for a long time. Or even a short time really. And it was truly good to have my friend's advice in my back pocket for the many times when I was tempted to think, "If I can't have a decent block of Bible reading time then it's just not worth even bothering." Because it is worth bothering to read even a little bit of the Bible and five minutes is so much better than no minutes in that particular season of life when the big, hour long block just isn't going to happen. That was advice for a specific time of life...and it was life saving advice. The best, more general advice, I have ever received is this. Always pray against bitterness. When bitterness takes hold it escalates into all sorts of horribleness. Often quickly. So much can be avoided if bitter thoughts are nipped in the bud. Bitterness due to some injustice - great or small. Bitterness wrought of some slow, simmering annoyance. Bitterness from feeling hard done by. Bitterness because I am a sinner and prone to bitter thoughts. I was glad to receive this advice many years ago. I haven't always been so good at applying it. But I always look upon it as the best advice I have ever received...and the best advice I would do well to heed. See to it that no one falls short of the grace of God and that no bitter root grows up to cause trouble. Amazed: that it is July. So soon. Sorted: myself onto Feedly by way of a reader with the impending demise of Google Reader. It was an 11th hour bid - late at night on 30th June. And happily it seemed I didn't need to get myself Chrome to manage it - it was quite happy with Internet Explorer. (I've got no idea what I'm talking about...tossing about all these techno-terms. Don't be fooled.) That said, from where I am sitting right now, it doesn't seem to have disappeared yet, although as Ali said here, maybe it just isn't 1st July in Google-land quite yet. Shall see what tomorrow brings. Saw: The Great Gatsby during June. I went during the middle of the day in the middle of the week - it felt even naughtier than being out on a school night - on my own and armed with a bag of maltesers that I didn't need to share with anyone (not the jumbo sized bag FYI.) It was an opulent, depressing, visually rich, sad, perfectly executed film. Magnificent. Luhrmann absolutely nailed it. Love: love, LOVED a visit from my dear buddy also during June. She flew in from another part of Australia and stayed with us for a few days, en route to other parts. So wonderful to share time with her again. It will be my turn to cross the border to visit her in a year or two. A most blessed friendship that always picks up where it left off and always, always deepens with each pass. And it was she who worked out that the apple peeler gadget could slink, adding to the fun of her visit. Chuffed: with the lovely Ally's lovely collection of teacup pictures. Looking at these is as good as sitting down with a cup of Early Grey tea and a good book. Enjoyed: the Egyptian exhibition brought out from the British Museum to our local museum. Immensely. The boys loved the mummies and the canopic jars. Real canopic jars that would have been used to house some poor distinguished Egyptian's innards. I loved studying the papyrus documents and writings carved on stone. It made me ponder the Bible anew - amazing to think that all those pages of the Bible would have been recorded like that, giving me fresh wonderment at the writing and preservation of God's Word. I tried to pass my wonder onto the boys but it is very hard to compete with canopic jars. Watching: West Wing all over again and loving it. And I have to say that the last five or ten minutes of episode ten in series one are probably the best ten minutes of television you'll ever see. Continuing: to think about a quote I read on Wendy's blog a while ago from Ted and Joni Eareckson-Tada's book Joni and Ken, an Untold Love Story. Says Joni, "If I were sitting next to you this very moment . . . wherever you are . . . I know what I would say to you. I would say, 'Oh, please pray for your partner.' Hands down, it beats any how-to marriage manual or nationally renowned couples' conference." Looking forward: to all your good advice. Signing: off for now. More craft preparation to do. In front of a West Wing episode.